We caught a brief glimpse of Mighty No. 4 during the Mighty No. 9 Kickstarter finale livestream, but now we've got an in-depth look behind this hulking menace. This guy is all about brute force. 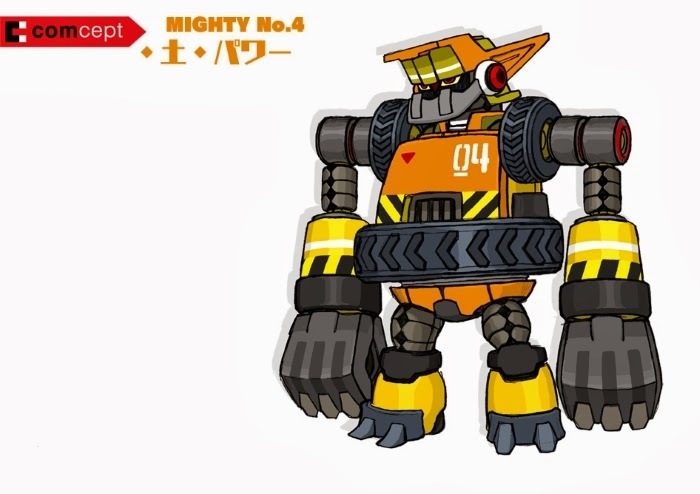 Unlike with some of the other boss characters, Mighty No.4's design was nailed down from the start. His body consists various construction/heavy lifting gear. -- had like a dump truck, the body of a big crane, bulldozer-like feet and excavator-scoop hands. As you can probably surmise, his theme is "earth." Dare I say, he reminds me a bit of Hitoshi Ariga's Guts Man. For more details and images, head over to today's Kickstarter update. Mighty No. 4... Dr. Right Number 4... Same difference, really! Lol yeah goseph it does have a guts man look. I'd be impressed you know the DLN numbers off memory. It does looks like a Turbo Man and Guts Man cross over.. Neat! Very nice! I can't wait for Mighty No. 9.. Megaman, rest easy and I hope you will resurrect again in the near future. Stay strong, Megaman. Now this is a design that I could actually say looks good. Like I said before, I wasn't all that impressed with many of the others they've shown so far.